A new school year deserves a new calendar. 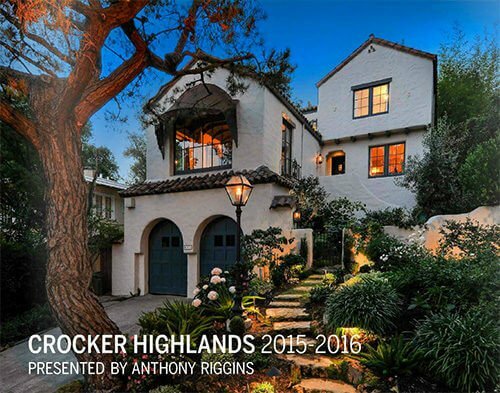 This year we have departed from the “Doors of Crocker Highlands”, and chose to feature images of homes I have sold in our neighborhood (plus my home!). What a great community we have here—I am so proud to have lived in the heart of Crocker Highlands for 24 years and counting. We are a community that thrives on its diversity and are all so lucky to be connected through the stellar education from our star elementary school and our highly rated middle school. Over the last eight years, I have personally given over $125,000 to Crocker Highlands Elementary School. It has been very important to give back to a community that has been so good to me. I attended public schools and sincerely believe in public education. It makes for a better community! Being able to underwrite the 4th Grade Gold Country trip brings so much joy to me year after year! I’m honored to be able to fund such programs that will remain great memories for the students for years to come! I also thank my team for my sellers’ success in setting record sale prices. They include two Buyer’s Agents who assist me at my Sunday Opens in answering questions about my listings, my Assistant, and my newest addition, my full-time Marketing Manager. No other agent has a full-time Marketing Manager on their staff which is why my well-known marketing remains at the top of its game over any brokerage in the East Bay. Thank you for your continued support. Please remember me for all of your real estate needs. The Most Wonderful Time of the Year: Holiday Party Season!